"With both a front and a rear clip, this harness is great for comfort, control and durability. The leash attachment in back is perfect for leisurely walks." "Has two leash attachments, one near the chest and one on the back, and...the sturdy handle up top is perfect for securing a pup in a car." "Fits tightly under a dog’s belly with soft sponge padding...For a perfect fit, the PetLove comes in seven different sizes, from teacup to Doberman." "A good choice to keep your small dog safe...features a simple step-in design which allows it to lose some of the bulk of extra buckles and snaps." "Comes in six colors and five sizes, and has a durable handle that helps easily lift your pup, whether it’s over rocks or into a car." "Puts the carting responsibility on your dog, while keeping him comfortable and free of strain. It comes in small, medium or large sizes." "A great alternative to a traditional dog hiking harness and a comfortable way to carry a pup...has padded straps and a breathable mesh front." The Ruffwear all-day adventure harness is our choice for all-around best hiking accessory. With both a front and a rear clip, this harness is great for comfort, control and durability. The leash attachment in the back is perfect for leisurely walks, while the front allows a dog owner to have more control of Fido’s movements. The Ruffwear comes in sizes ranging XS to XL, and has four buckles you can adjust to make sure it’s a great fit. It also comes in 10 different colors—and while your pup may not appreciate how well the wildberry look matches your running shoes, it’s okay to accessorize your pets a little. We love the extra-padded belly and chest panels that won’t cause chafing during long walks, and the ID tag pocket for worse-case scenarios. Owners say their dogs love the harness and rave that the front clip is perfect for training pups who pull during walks. Reviewers do state that longer haired dogs may need to size up, but otherwise the sizes are true to form. If you’re looking for a top-of-the-line harness that will keep your dog happy during all outdoor activities, the Ruffwear Front Range is the best you can buy. The Expawlorer no-pull harness is a slightly less expensive (but still great) dog harness for hiking and long adventures. This harness also has two leash attachments, one near the chest and one on the back, and comes in five sizes. It’s a smaller harness than the Ruffwear, taking up less of the dog’s body, which is a good choice if your pup tends to fight any and all accessories. All three colors—black, orange and green—have reflective striping, which makes this harness a great choice for nighttime hikes. Our favorite feature of the Expawlorer harness is the sturdy handle up top, perfect for securing a pup in a car or helping a senior dog get around. Owners love that the Expawlorer harness doesn’t rub dog skin raw, and reviewers state that it allows for a good deal of control over wild and energetic pups. If you’re looking for a great hiking harness at a lower price, the Expawlorer can’t be beat. If your dog isn’t a puller and doesn’t need much support or a strong lead, the PetLove soft harness is a great choice to keep him happy on long hikes. While it doesn’t offer as much strength over energetic pups, the PetLove fits tightly under a dog’s belly with soft sponge padding, and comes with a three-month warranty. For a perfect fit, the PetLove comes in seven different sizes, from teacup to Doberman. It also comes in five different colors, each with reflective detailing and a large handle on the top. We love the PetLove harness for senior pups who don’t need as much lead control as younger dogs, but who could benefit from a slightly cozier and softer harness. The handle is also wide, and can help arthritic bones stay active when your dog needs a little extra help. Not all dogs are built alike, and sometimes a smaller pup may not need the same support as a larger one. 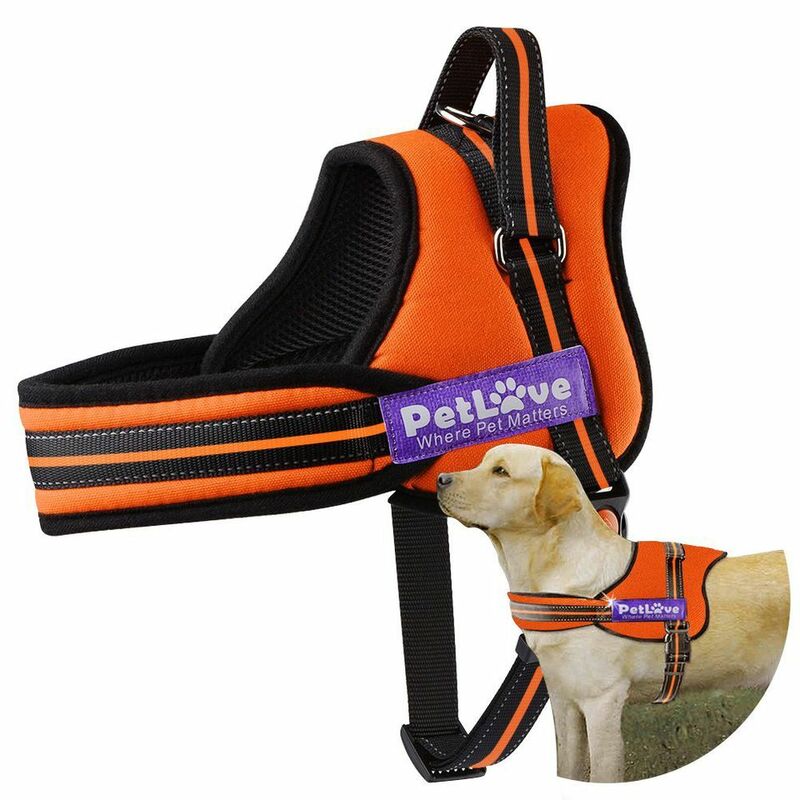 While most of the above harnesses work great for large jobs, the Pawtitas adjustable harness is a good choice to keep your small dog safe without the bulk of some of the larger ones. It comes in four sizes, and the XS size is perfect for a 5-10 pound pup. We love that the Pawtitas comes in 13 colors and is affordable enough that you can purchase a different color for every season. The harness features a simple step-in design which allows it to lose some of the bulk of extra buckles and snaps. While you may want a stronger, more padded harness for really intense hikes, the Pawtitas harness is perfect for leisurely summits and calmer, smaller dogs. If you’re an avid hiker who climbs and scales more intense mountains, you’ll want to make sure you purchase a very secure and sturdy harness to help your pup over large rocks and scrambling sections. The Ruffwear Web Master harness has one extra strap that secures a dog around its belly, keeping it even safer when maneuvering over obstacles. It comes in six colors and five sizes, and has a durable handle that helps easily lift your pup, whether it’s over rocks or into a car. Many reviewers say the Ruffwear Web Master is also a wonderful choice for securing escape artist pups, thanks to the extra strap. It can be adjusted at all points, allowing for a comfortable fit on those extreme hikes. When you take your pup for a long hike, it’s essential to bring food and water to keep him hydrated and powered up, but that doesn’t mean you have to lug it all for him. The Ruff Armour dog backpack puts the carting responsibility on your dog, while keeping him comfortable and free of strain. It comes in small, medium or large sizes, though we’d recommend only using a dog backpack with a larger, younger pup. Each side of the harness has a small zippered pack, perfect for water, dog toys or extra food. The best feature is the included portable dog bowls that can be attached to the harness, so your furry friend can have a snack without worry about finding level ground. Owners love the mesh harness, and say it’s breathable enough for a full day’s hike or an overnight camping trip. If your dog is active and strong enough to carry his own food, the Ruff Armour backpack is a great way to share the load (he’ll be happy to help, trust us). Just because your pooch is too small or too young to handle a hike doesn’t mean he or she can’t come along for the trip. The Pawaboo backpack is a great alternative to a traditional dog hiking harness and a comfortable way to carry a pup up to 15 pounds. This affordable pack has padded straps and a breathable mesh front that allows both you and the pup to stay cool and comfortable. We love that the Pawaboo is a front-facing backpack, so you can keep an eye on Fido throughout your whole trek. Reviewers say the adjustable straps can accommodate a variety of body types and dog sizes, and say it’s a great way to bring a small pup on bike rides as well as up steep mountains.